Having been to a few wargaming conventions it has to be said the standard of terrain, buildings and accessories is astounding. It certainly is a far cry from the days of using the lounge room floor, the billiard table or throwing a green sheet over the dinner table! Those who wargame with miniatures take their hobby very seriously and use various bits of terrain to make their battle more historically accurate or life-like. There are plenty of companies and indivudals around today who make wargaming accessories professionally and we will be reviewing some of them in the near future. But while you can spend lots of money adding those final touches to a table-top battle, you can also achieve a lot with a little imagination. 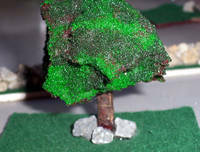 For example, while trying to interest my youngsters in wargaming with miniatures I thought adding a few trees and stone walls might boost the visual appeal. The trees were easy enough. I ripped off various shapes of foam rubber, painted them in shades of green, attached them to cut off sticks and then on to bases to form basic trees. Hey, they may not be award-winning standard, but they are fun to make and are very cost effective. The stone walls took more time, but came up really well. Basically we built them on a balsa-wood base and pretty much as you would build a ful-size one - stone by stone. Needless to say we used gravel from our path and then glued each stone into place as we went. A little bit of sand boosted the look.